Ice conditions are the talk after a car went through here on the lake. You need to be extra careful this year due to the fact that guys have been driving in normally questionable areas that became accessible due to good ice conditions. If you stick to the normal travel corridors there is still around 20″ of ice, and guys are still driving around to the lights from Schafers. Please stop and check if you are unsure of conditions and do not drive anywhere where you are not familiar with conditions. This next week we are going to continue to lose ice so the driving on the lake days are numbered. As far as fishing goes we continue to have wide swings in temperature which slows down the fish for 2-3 days after each swing. The extended forecast looks promising however with steady highs in the low 30’s and lows in the 20’s. Lately the northern have come back down to earth but guys are still doing well. I expect that bite to pick back up as we get warmer. 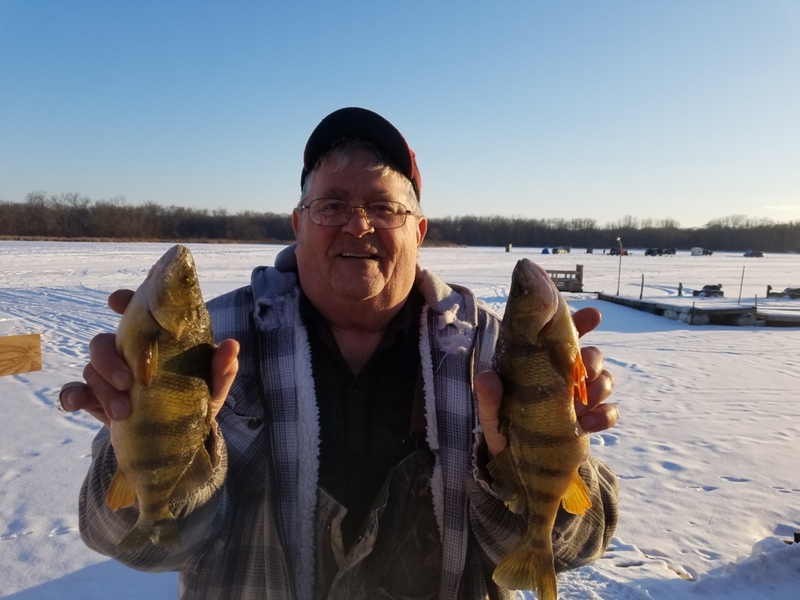 The perch bite has been steady with big fish still being caught, but not in the quantity that we saw earlier this year. The crappies have become more active as well as the bluegills and this coming week should continue that pattern. Stop in and get the latest fish and ice report! With the exception of a few days in the 20’s the forecast is looking good with lots of highs in the 30’s and lows in the 20’s. This should pick up the bite, there is definitely no shortage of fish! As far as the latest information that I have the northern bite remains excellent, and I expect it to keep up through spring. The perch schools over by the lights have been scattered, if you can find where they are you are going to do well. The bluegill bite is steady in the shallows, and when the big schools hanging deep decide to get active it will be a blast to fish them. Be careful driving guys are pushing the limits in areas that are traditionally bad spots, there is going to be lots of ice for a while but certain areas thin up quicker then others. Stop in for the latest report! I hope everyone who fished in the BPCA derby had a good time, the fish board was impressive. I looked back through the results they had posted on their website and this year was the biggest group of northern that I could find. On that note the northern bite is continuing, go over by the lights and you will tie into some nice fish. The crappie bite remains fair, with the biggest challenge being finding out their active times. Early and late are always a good bet, but lately there has been an early afternoon bite as well. Bluegills remain most active in the shallows, but you are able to pick a few up in the dredge lines. Perch continue to move, and if you get in front of them they are a ton of fun to catch. The key is being willing to pack up and move multiple times in a day. Ralph came home with 18 nice perch last night, and here are two 13′ monsters that made it into his bucket!